In CRM Portal, different web form steps of a web form can operate on different entities. Imagine you have an Enrolment web form that allows students to enrol in courses. The first step of this form might capture student details (Student entity). 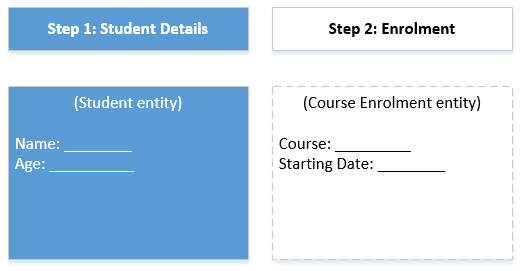 The second step might capture the enrolment details (Course Enrolment entity). The Student entity would have a lookup to the Course Enrolment entity in this particular example. Each web form step of the web form must have a Mode specified, which can be Insert, Edit or ReadOnly. If you want to allow users to be able to edit the form (e.g. save and resume), then you would typically need (at a minimum) a web form where all the steps are set to Edit mode. As the 2nd step operates on a related record, and not the main record that the user clicked on to launch the form however, there is no OOTB way to configure this as an Edit step. Since our record is not related to the current Portal User, option 2 and 4 above are no good. Since the record that our 2nd step operates on is different to that of the 1st step, option 3 is also no good. The only viable option for us is the first option, Query String. The problem here is that CRM Portal does not include the ID of the related record (the one our 2nd step operates on) in the URL when the user navigates to the 2nd step of the form. So how do we workaround this? Make the lookup field above read-only on the backing CRM form so that users cannot update this field on the Portal. //Append the ID of the related record to the form's post URL using the 'relatedid' query string parameter. //If this query string param already exists in the URL then it is updated. Else, it is appended to the end of the URL. //The URL does not contain our param so just add it. //Find the existing param in the URL and replace its value. Now you should be able to edit the related entity on your 2nd web form step. This entry was posted in CRM, CRM Portal. Bookmark the permalink.